3) Restores Town/City Search facility. You can download the update using iTunes on your computer or App Store on your iPhone / iPod Touch. 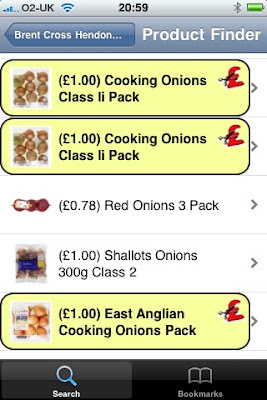 The need to sort out the "Town/City Search" issue with Tesco Finder gave me the excuse to update this iPhone application with the users' most requested feature: prices and offers. The updated application has just been submitted to the Apple iTunes App Store and so should be arriving on your iPhone in the next few days. 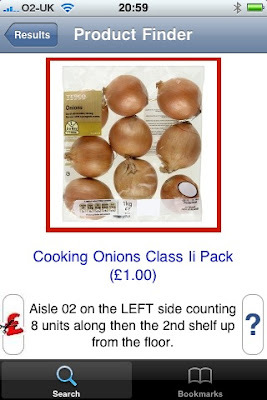 This new data come from the live Tesco Grocery API. If the store you are searching delivers grocery home shopping, you'll see prices (and offers where relevant) on every product. If the store you are searching does not deliver home shopping, the data comes from looking up the information at one of our so-called"Dotcom-Only Store" warehouses, which has amongst the largest product ranges. The range you search will be for your selected store, but the prices and offers (which are national anyway) will come from the warehouse range, as long as there is a 1:1 match. Some products may show without a price if it's in your store but not in the warehouse. I hope you like the updates. Actually I better give the source code back to my colleague and the app's author, Tom Courthold, before I do anything more to it. I'll be in enough trouble as it is! Anyway this update application is on its way to you now, and will appear in your updates list as soon as it passes through Apple's QA team. If you attempt to use Tesco Finder's "Town/City Search" function to locate a Tesco store manually, you'll find you get the message, "I couldn't connect to Google.com. Please check your network connection or try again later.". So what's happening? Basically we've programmed Tesco Finder to use Google's geo-search API, where we pass on the town or city name you typed in and get back the latitude and longitude of that place. 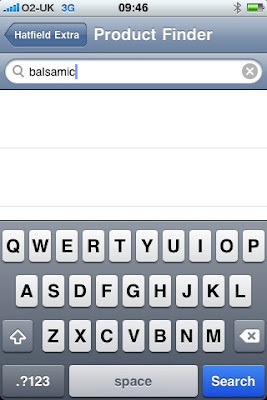 We then use that data instead of iPhone's location to perform the Tesco store search. It's been working wonderfully for the two months we've been testing the app. However, "wonderfully" ended on Tuesday just after it arrived in the App Store. Talk about timing! Google's geo-search API comes up with an 'error 610' every time we use it now, rather than the actual latitude and longitude. 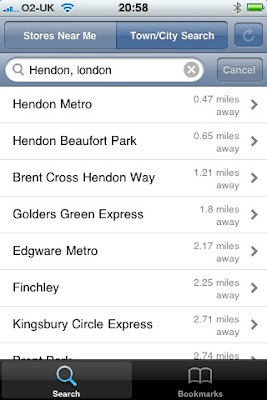 ..where a customer typed in 'hendon' into Tesco Finder. ...where those last two values are the latitude and longitude of Hendon in London. In fact we're getting 610,0,0,0 for anything we type in. So now I need to find a working (and free to use) API that will convert UK towns and cities into latitudes and longitudes as easily as this. I then need to issue an update to the Apple iTunes App Store with its usual 10-14 day delay before it goes live. There's a lesson to learn here, and that is when you write applications of this sort, always make them talk only to your own servers and not directly to third party services. If I had done this, I would have simply scouted for a replacement API and adjusted our server's code to use that. The iPhone app would just use our server to ask for geo-coordinates every time, not caring about what the server had to do to get the data. The server could be coded to have backup geo-data suppliers in case one didn't work. Doing it this way makes you the master of your own destiny and not beholden to anyone else. In trusting the third party service I was trying to be clever. Fail. I need to get out of the web mindset where you actually only have one application - your web application. We have thousands of Tesco Finder applications out there, so now I have a new rule: The only place our apps will 'phone' from now on, is home. I'm not the only one suddenly getting this problem - Google Forum thread on it here - it seems they have updated their code after the weekend to require a licence key - only serving to highlight that this would have been an easy fix if only I had coded the app to look to our server. 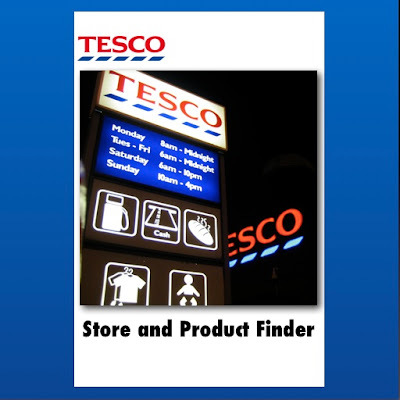 You may be interested to know that today we've reached 4,000 downloads of our iPhone Tesco Finder application, and that the Tesco API is servicing anonymous product search requests at the rate of one every 20 seconds during the day and evening. 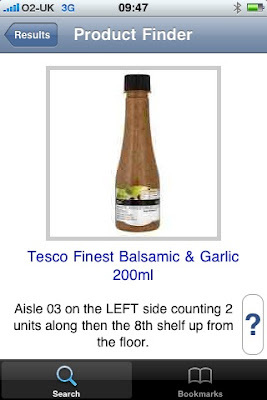 You may also like to know that one of Tesco Finder's hidden talents is that you can search on a 13-digit barcode. Just read any barcode from a grocery product and type it in. If it's stocked at your selected store we'll show you it (complete with image if we have it). Yes I know it would be great if you could use Tesco Finder to point the iPhone at a barcode so it could work out the number and perform the search. It would be like a... a.. red laser? We think so too! Patience, innovation fans; just for a short time. It's early days but I have to pass on the team's excitement that, since the iPhone Tesco Finder application arrived in the Apple App Store on Saturday, we've had just over 1,000 downloads of the application. In addition, product search requests (which are entirely anonymous) are being serviced by the Tesco API at the average rate of once a minute. TescoNav, a great idea! Works well, pricing would be a bonus but I'm very impressed! Wow! This is a great app - so simple but so effective - and a great app if you like showing off your iPhone to your friends!!! I used it at my local store (Brent Cross) and it found everything I was looking for. ... BTW I saw someone else using this app on their iphone in the store too - we should form a club! Yes this application will be going on quite a journey in the care of its developer, Tom Courthold, who is looking forward to adding new facilities and updating the interfaces. It's Tom's forethought and energy that have gone into the work to build and support the application, and he's excited to take 'his baby' forward. We don't show prices because currently (like our grocery web site) we don't have access to realtime prices, only what we call 'guide prices'. Guide prices are the most expensive a product can be at Tesco - quite often in the stores the price is cheaper - and our home shopping customers actually pay these cheaper prices too. They get a pleasant surprise when they see their actual bill is less expensive than they thought it would be. It's why you can't rely on price comparison sites like MySupermarket when reviewing Tesco prices, because I understand that they 'scrape' our web site and get the guide prices and not the realtime prices for products (that's why I think Asda say they are cheaper - they compare our guide prices on MySupermarket with their own. If they saw our realtime prices I bet they would get a nasty shock!). We hope to show realtime prices at some stage soon, both on our web site and on this app. We don't show current stock levels because we couldn't be accurate. The main reason is that when a product is emptied from a shelf, it's because another customer who is probably still in the store has removed the last one(s) and staff haven't got round to re-filling the shelf. Normally staff are pretty quick at spotting gaps so if you spot one first, the customer who has removed the products is probably still in eyesight range. If Tesco Finder says a product is at the store and you can't spot it, you only need to ask a member of staff to check for you. Yes a weak mobile signal is a tricky problem, and no we don't provide public wifi in our stores. The best answer to this at the moment is that you walk towards the front of the store to pick up a stronger signal for your search, then walk to the location described. Providing free wifi is a great idea on paper but our store IT colleagues will have to think this through since we use Wifi so much ourselves in staff devices - so no promises! As I say, it's early days for this application, and our remit is to innovate, so look out for some great new functionality as Tom takes it forwards. 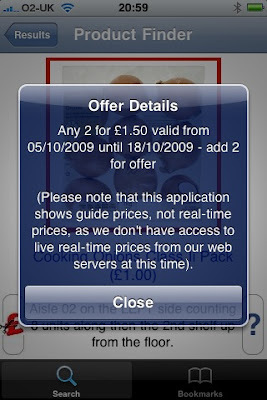 And... yes the Tesco iPhone Grocery Home Shopping application is already beginning to look wonderful, with some great original thinking. What? No you can't "see some screen-shots" - be patient! 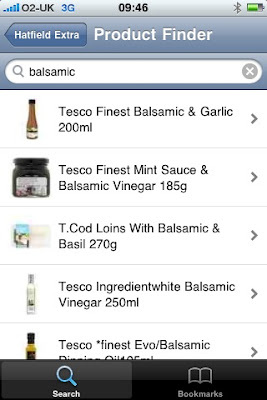 Tesco Store and Product Finder - Live in the Apple iTunes App Store! I'm delighted to tell you that our first iPhone application has just gone live in Apple's iTunes App Store. 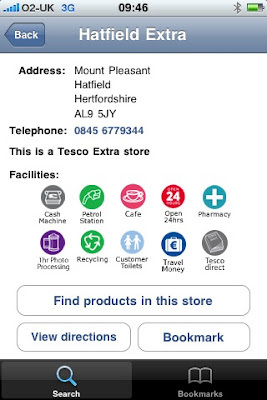 The Tesco Store and Product Finder not only helps you to locate your nearest UK Tesco store (of any size from Express to Extra) but also will help you find any grocery product in that store by describing its aisle and shelf. The application is free and available worldwide although it only works for UK stores and only with grocery products (rather than non-food items) at the moment. 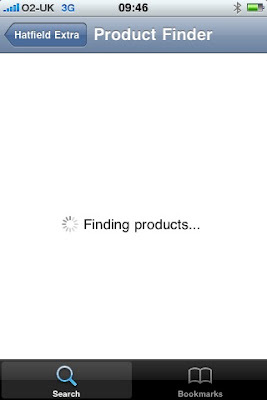 On your iPhone (or iPod Touch) start 'App Store', touch Search and search for 'Tesco'. 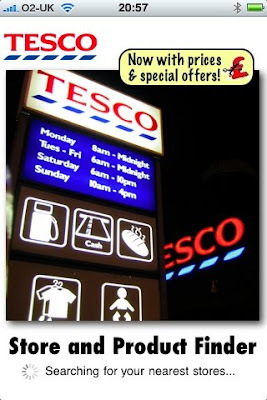 You'll get "Tesco.com R&D Team" and "Tesco Finder" results - select either to reach the Tesco Finder application. This application is the first piece of innovation that has come from Tesco.com's R&D-run IT Innovation Club, where we provide the resources, time, and stamp of approval for our staff to quickly create innovation for our customers outside of our standard production work schedule. The Tesco Store and Product Finder was designed and built by Tom Courthold who works in Tesco.com's IT UI team; the data was - and is - sourced by Mike Brearley who now works in our IT branch dev team, with backend API server programming, a spot of iPhone programming (and support for the service & application) by myself. The ability for a customer to search for any grocery product and then find out the nearest stores that stock it. A link to a home shopping customer's favourites list so they can find these products in any Tesco store that stocks them. Work with the business to extend the range beyond groceries to include more non-food items such as electricals, household items and more. Enjoy the application, and please feedback any ideas and issues to me. Now touch the desired product to bring up its location details, alongside a bigger image of the product - and its full location information. Tap the big question mark for extended help.